Five student-artists unveil intriguing works in a preview senior-studio art exhibition that draws from a broad spectrum of mediums and styles. 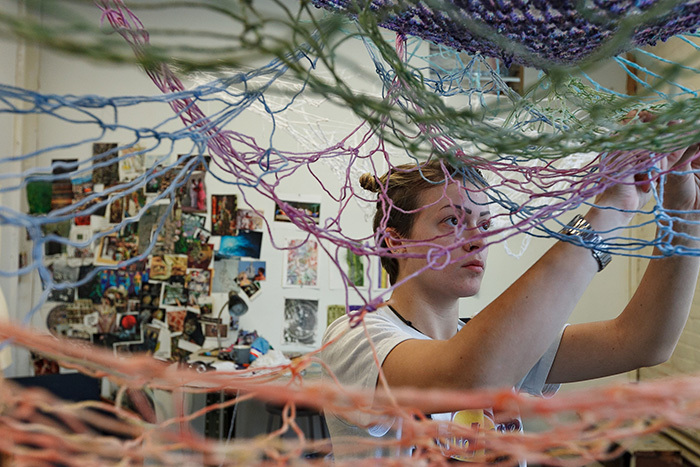 Opening Nov. 8 and running through Dec. 9, the show is a milestone for senior studio-art majors, and presents an opportunity for members of the campus community to get a sneak peek at emerging bodies of work. Talia Amorosano (art & art history, English) uses drawing, photography, sculpture, text, digital processes and video to create an installation that, at first glance, appears to be a typical office setting. On closer examination, we discover skewed perspectives and confounding objects, like a darkly funny company-orientation video, absurdist “motivational” posters and more. "I want my work to be accessible, interactive, immersive and entertaining, and I want it to challenge the notion that art is just a thing to passively observe," she says. The exhibition represents an important step for the student-artists, as they approach the midway point of their senior-year seminar. All through the year, they work together in individual studios in the Goodyear Gallery and critique each other’s work, under direction of Professor of Art Ward Davenny, who leads this year’s seminar, in collaboration with fellow studio-art faculty. The students also learn how to apply for work in galleries and how to properly document and present their art, and they take trips to galleries and museums to keep abreast of current work. In April, they will design, hang and present a major joint exhibition in The Trout Gallery, complete with a full-color exhibition catalogue. The exhibition is on display in the Goodyear Gallery (Goodyear Building, Cedar Street entrance). Hours: Tuesday-Friday, 3-5 p.m.; Saturday, 2-5 p.m. Gallery closed Nov. 20-28.